Learn the two ways you can control the speed of the game. There are two specific volleyball tactics you can use, to control or change the speed of the game. This first tactic may not seem like a crafty thing to do during a game, but walking back to serve the ball every so often during a match is one thing that serves a purpose if used intelligently. Serious players on the court, are in the habit of hustling to get from one position or one zone to the next. Usually it is a good idea to jog back to the service line when its time for you to serve. Most players do this so they can take advantage of taking as much time as possible to get set up to serve the ball before the referee blows the whistle to start the rally. But when you run back to the service line to serve the ball you are potentially speeding up the rhythm of the game. The sooner you get behind the service line, the faster the referee sees you are ready to start the rally, so he blows his whistle, which starts the rally at a faster rate. Sometimes its necessary to give your front row hitters a chance to catch their breath. Let's say your team has lost a few points in a row to a team that runs a pretty quick offense. Then, you and your teammates fight through a long rally and you all manage to win the sideout. Far the last few plays, the opposing team has been running a quick offense so they're the ones who've been controlling the speed of the game. Now, that your team has won the ball back, do you want to run back quickly and serve the ball, keeping the same pace of the game that your opponents have established? Or do you want to slow things down a bit to establish your own team's rhythm? your setter has a few more seconds to talk about team strategies and volleyball tactics to the blockers while your team is rotating and setting up to play defense. Without risking a yellow card or getting a 'delay of game' warning, you can change the rhythm of the game by walking instead of running back to the service line. The referee will wait for you to be in position behind the end line before blowing the whistle to start the rally. Libero Volleyball Tactics and Strategies: Nowadays, volleyball plays are designed so that when the setter digs a ball, the libero steps in to set to the front or back row. In a perfect game, the libero or back row players would pass the ball to the designated setter, who would be the only player to set every second ball. If the designated setter defends the first ball then she can't set the second one, soon else has to. In this case, one of the most popular offensive volleyball tactics teams follow is that the libero steps in to set the ball. 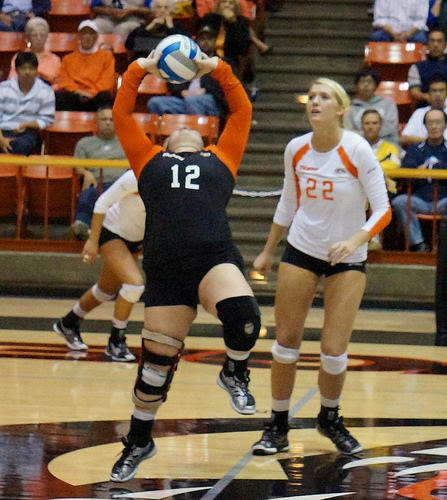 It use to be commonplace that the right side hitter also known as the 'off side hitter' or "oppo' would step in to set the ball that a starting setter dug. 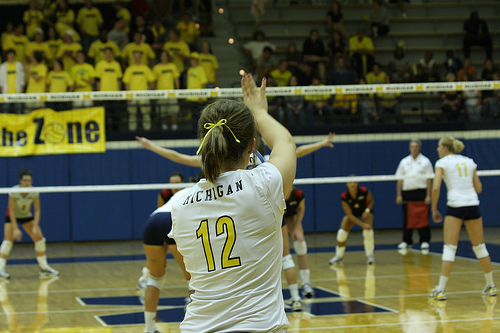 Nowadays, volleyball plays are designed so that when the setter digs a ball, the libero steps in to set to the front or back row. If this situation occurs, then it should not become a weak point in your team's offense. To maintain control of the pace of the game the libero should be sure to get her knees, hips, shoulders and forehead lined up underneath the ball to get into position to set a nice high ball to her outsides or backrow hitters. Liberos should practice being as good a setter as the setters. They should do alot of setting drills in practice because they are the second most likely player to set a ball on the court. But when they do set, they're setting from the back row and especially in high school the setter needs to give a hittable ball to their potential hitters. It's best not to risk increasing the speed of the game unnecessarily by shooting a fast set to the middle or outside. The libero needs to help the team establish it's own rhythm by setting the ball high to the outside spiker or backrow hitter. increase the chances of building trust among their hitters by giving them hittable balls.